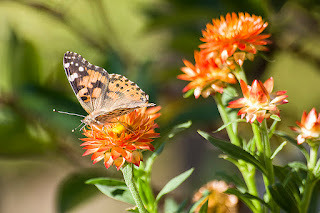 Painted Lady butterflies are about the only butterflies I saw this past summer. They were very enjoyable and photogenic though. I think they got used to me hanging around and taking their picture. I captured this one enjoying the Strawflower plant that is on my deck.